Palletable by the Urban Bush Carpenters opens Thursday 29 August at The Substation, Newport, with an opening reception from 6-8pm. 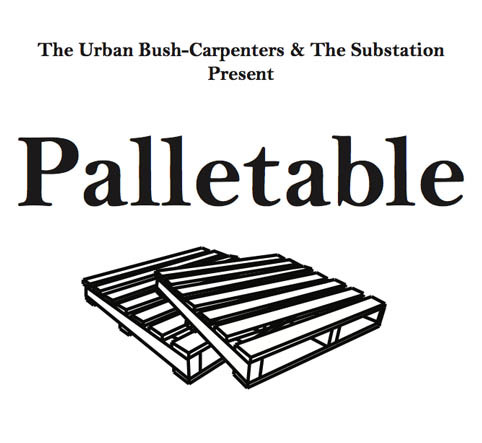 "The Community Access Gallery will be transformed into an exhibition hub for sharing DIY ideas on how to re-use pallets. They're the grease of the global trade. Around the world there are billions. Find them outside a store near you, truck terminals, ports, construction sites, retail outlets, manufacturing plants, and abandoned plots or along train lines. In pallets, as in life: you never know what you're going to get. Some will come apart like lego, others will crack and split or refuse to budge. People have used them to make planter boxes, raised gardens, compost bins, benches, beds, tables, shelves, paths, eskys, ladders, sheds, houses, saunas, boats and arks." Workshops open to the public will be held on Sunday 1 September and Sunday 6 October. For bookings contact info@thesubstation.org.au. The exhibition runs until 6 October.